Welcome to "Under the Red Roof" an attempt to gather memories of Nickerson Farms Restaurants. Employees, travelers, or just interested parties. Greetings Nickerson Family. It has been a long time since I updated, but here I am. I have about 40 post cards from NF, all the same common building with the address on the back the only difference. Well on E-bay there appeared this one in Waynesville MO. Totally different. Does anyone know if this was the first one? Or was it a later one, possibly a Farmers Table? I am open to thoughts and ideas. Also if you have any post cards I would love to have a copy of the back, it validates the NF actually existed. Thanks and keep your eyes open as you travel this summer, I would love updates. This is a picture of the Witmor Farms Restaurant. I had heard that at one time it was a Nickerson Farms but had never seen any evidence to confirm that. 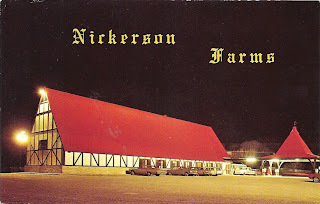 When I travelled through Missouri on I-44 back in the heyday of Nickerson Farms, it was Witmor Farms. It must have been one of the earliest Nickerson Farms restaurants. .We spotted the Nickerson Farms Restaurant in Az a couple of years ago as we were travelling from British Columbia,Can to Tucson . Since I am a Nickerson,I was quite interested in the place,though,unfortunately abandoned. This year again as passing by,decided to stop and see the remains...........havw been curious about this place,thanks to the bloggers here, I now know a bit more about it !Does anyone know the full name of the Nickerson that started the franchise? Here is a quick list of all known Nickerson Farms Resturants. Some were built, but removed while others were never built. I am always looking for more info or a place I might have missed. Calling all Nickerson Farms employees! Did you start your working life at Nickerson Farms? Do you remember the tall red roof and bee hive? Miss the hot loaf of bread and honey butter? Well, you are at the right place. This blog is intended to be a gathering place for all NF Alumni. Over the next few months I will post pictures and information. I welcome your input, memories and thoughts. I am saddened to report, the Nickerson Farms building at Picacho Peak Arizona has collapsed. Thanks to Dr. FD for the update and great pictures. While not the last standing it was one of the few which was totally abandoned, nearly from the beginning. Many of these restaurants were built miles from any population, depending on the highway traffic to survive, which they did not. Welcome to the gathering place for all those interested in Nickerson Farms Restaurants. Employees, visitors, or those who remember these great places are welcome to comment.